Don’t miss the kick off of the Golden Boy DAZN Thursday Night Fights series, Filipino lightweight contender Mercito “No Mercy” Gesta (32-2-2, 17 KOs) will take on Mexican warrior Juan Antonio “El Mozo” Rodriguez (29-7, 25 KOs) in a 10-round main event, taking place Thursday, March 21, 2019 at Avalon Hollywood. Manuel Avila 125.8 vs Jose Gonzalez 125.6. To kick off the Golden Boy DAZN Thursday Night Fights series, Filipino lightweight contender Mercito “No Mercy” Gesta (32-2-2, 17 KOs) will take on Mexican warrior Juan Antonio “El Mozo” Rodriguez (29-7, 25 KOs) in a 10-round main event, taking place Thursday, March 21, 2019 at Avalon Hollywood. Details for how to watch the fights will be announced shortly. Gesta, who now calls San Diego, Calif. his home, is a 31-year-old seasoned contender who has previously had two world title opportunities. In his first shot at a title, Gesta fought Miguel “Titere” Vazquez for the IBF Lightweight World Championship. In his second shot, Gesta took on WBA, WBC Diamond and Ring Magazine World Champion Jorge “El Niño de Oro” Linares, considered the very best lightweight in the world at the time. The southpaw will return after defeating Roberto “Tito” Manzanarez via majority decision in June 2018 as he plans to earn another shot at a 135-pound title. Rodriguez is a 31-year-old southpaw who has fought against former world champions Billy “The Kid” Dib and Javier “El Abejon” Fortuna. The native of Puebla, Mexico has also challenged Jezreel “El Invisible” Corrales for the WBA Interim Super Featherweight World Title. Rodriguez will look to initiate a campaign at lightweight by taking on one of its best contenders in Gesta. In the co-main event, Ferdinand “Lucky Boy” Kerobyan (11-0, 6 KOs) of North Hollywood, Calif. will battle Blair “The Flair” Cobbs (9-0-1. 6 KOs) of Las Vegas, Nev. for the vacant Junior NABF Welterweight Title in an eight-round battle between two undefeated Golden Boy prospects. Manuel “Tino” Avila (23-1, 8 KOs) of Fairfield, Calif. will return in an eight-round featherweight fight against Jose Gonzalez (23-7, 13 KOs) of Guadalajara, Mexico. 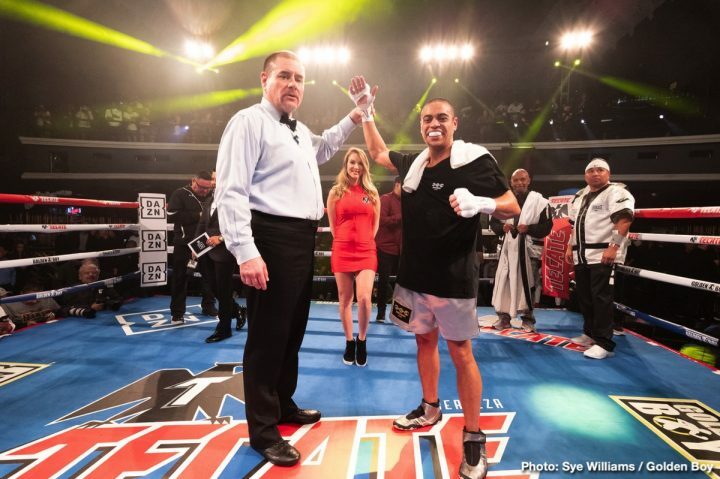 David “Junebug” Mijares (6-0, 3 KOs) of Pasadena, Calif. will face Antonio Sanchez(6-5-2, 3 KOs) of Bayamon, Puerto Rico in a super lightweight fight scheduled for six rounds. James “The Beast” Wilson (7-0, 6 KOs) of Los Angeles, Calif., a quick-handed heavyweight prospect who has also fought as a mixed martial artist and a kickboxer, will compete against Nick Jones (7-2, 5 KOs) of Okmulgee, Okla. in his first six-round fight as an official member of the Golden Boy stable. Chris Ousley(9-0, 8 KOs), a newly-signed super welterweight prospect of Chicago, Ill., will participate in a six-round fight against a soon-to-be announced opponent. Gesta vs. Rodriguez is a 10-round lightweight fight presented by Golden Boy y Paco Presents. The event is sponsored by Tecate,”THE OFFICIAL BEER OF BOXING.” The fights will take place Thursday, March 21, 2019 at Avalon Hollywood. Golden Boy, the leading media and entertainment brand, has teamed up with global sports streaming giant DAZN to announce the launch of a new monthly boxing series featuring top prospects and rising contenders. The series debuts on Thursday, March 21, 2019 at Avalon Hollywood and consists of a three-hour program including a two-hour block of live fights followed by a one-hour studio show. The studio show will feature renowned writers from Ring Magazine as they provide in-depth analysis and previews from boxing events around the globe. The series will be distributed to regional cable channels throughout the U.S. as well as across the globe on international TV stations and networks. Fight fans have yearned for a consistent night and time for boxing, left by the void caused by the loss of USA’s Tuesday Night Fights, which ran for 16 years, and ESPN’s Friday Night Fights, which ran for an additional 17 years before being cancelled in 2015. A consistent night and time for pugilistic action was part of the boxing culture for over 30 years, and Golden Boy is proud to bring it back and grow a new fan base around this series. These events will also introduce and familiarize fans with the world champions and stars of the next generation, who will then graduate to the kind of high-caliber DAZN events that currently feature the likes of Canelo Alvarez, Anthony Joshua, Jaime Munguia, and many others. Golden Boy’s in-house production entity will produce the live series as a Golden Boy DAZN presentation. The monthly live fights and studio show will air from 10:00 p.m. – 1:00 a.m. ET/7:00 p.m. – 10:00 p.m. PT on regional cable channels throughout the U.S. as well as across the globe on international TV stations and networks. Golden Boy will work closely with its U.S. and international affiliates, supplying them with customized promos and marketing materials to drive fans to tune-in to the series. Details on the Golden Boy DAZN affiliates will be announced shortly.